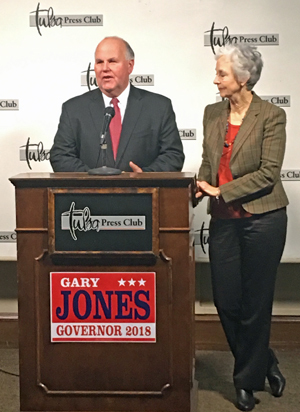 State Auditor Gary Jones Wednesday officially kicked off his bid for the state’s highest office in Tulsa promising to be a Governor for all Oklahomans. 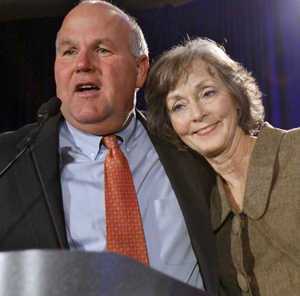 A Jones administration will put Oklahomans first – well ahead of the powerbrokers. He has a reputation of being a strong public servant working hard for all constituents. Jones promises to find solutions to Oklahoma’s short-term money woes and develop a long-range strategy to make our state prosperous. “I’m not someone who is going to kick the can down the road,” Jones said. I’m not afraid of hard work and I won’t turn away from problems or look for an easy fix. Our problems won’t be addressed by leaving things to the next generation to figure out. “I lead by example,” Jones said. “The annual pattern of crisis budgeting meant we had to do some serious work in the State Auditor’s Office to ensure we could sustain budget cuts year after year after year. We did what was necessary by eliminating most administrative positions, reducing travel, and purchasing software that improved both our work product and efficiencies. Jones has been calling for performance audits of state agencies for seven years but it took recent scandals for those calls to be echoed by a majority of legislators. Jones was born in Ft. Sill, the son of a career Army Master Sargent, and grew up in Southwest Oklahoma. Along with his wife Mary Jane, a retired school teacher, they operate a cow/calf operation begun almost four decades ago. They have two children and three grandchildren. For more information, visit www.jonesok2018.com. This entry was posted in State on November 16, 2017 by admin.